Note: This review discusses the Orbi's performance in a Windows environment. There's a very similar version of this story that discusses this router's performance in a Mac environment on our sister site Macworld.com. Ignore Netgear’s advertising: Its Orbi Wi-Fi router is not a mesh network system. Orbi satellites don’t communicate with each other; they send and receive data to and from the Orbi router only. In networking parlance, that is a hub-and-spoke system, not a mesh. But mesh networking is what has everyone so excited this year, so that’s how Netgear is billing the Orbi. 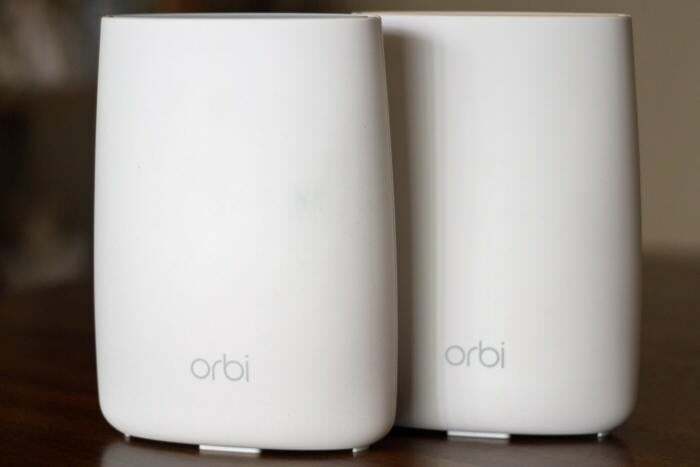 The company is doing itself a disservice: The Orbi might be the best interior-decorator-approved router on the market. About that industrial design: The Orbi is not nearly as small or unobtrusive as the Eero, Google Wifi, or Linksys Velop. Those first two products strike a very low profile, and the Velop looks like a bud vase. A hollowed-out Orbi would be big enough to hold a whole bouquet of flowers, measuring 8.89 inches tall and 6.67 inches wide. It’s not ugly, if you like modern aesthetics, but it’s not going to disappear into the background as easily as those other routers do. And that’s okay, because Netgear is the only router company that hasn’t taken away the ethernet switch and USB port in order to make its product smaller and more stylish. 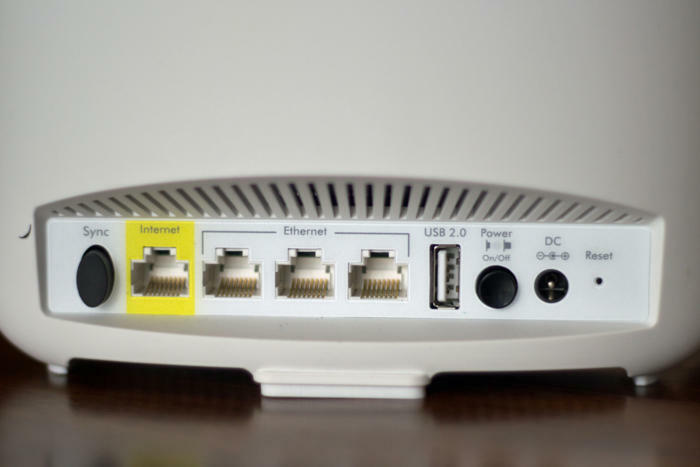 The competition puts just two ethernet ports on their routers and satellites, which means you’ll need to buy an ethernet switch if you want to hardwire more than one device to them. And many new-school routers don’t have USB ports at all (the Securifi Almond 3 is an exception on both counts—it has three ethernet ports and a USB port). But before you get too excited about the presence of a USB port on the Orbi, know that it is currently dormant. You can’t use it to connect a USB hard drive or a USB printer that you want to share over your network. The Netgear Orbi has a comparatively large footprint compared to the competition. From left to right: Linksys Velop, Eero, Luma, Google Wifi, and Securifi Almond 3 (black). But it’s there—as is an equally dormant Bluetooth radio—so Netgear must have plans for it. My guess: Netgear will either release a firmware update that enables it for storage, or they’ll come out with a ZigBee or Z-Wave radio dongle and make a play in the Internet of Things/smart-home space. But if USB support is on your must-have list, don’t buy an Orbi until you know for sure what it will support. And if you need network storage, buy a NAS box—you’ll be much happier. We recently reviewed seven and found some genuine bargains. The Netgear Orbi is a tri-band router with six internal antennas, making the Linksys Velop its closest competitor. But the Orbi’s three networks are very different from the Velop: The Orbi operates one network on the 2.4GHz band (with a 2x2 radio—two spatial streams up and two spatial streams down—offering speeds up to 400Mbps), one network on the 5GHz band (with a 2x2 radio offering maximum speed of 866Mbps), and a second 5GHz network with a 4x4 radio offering maximum speed of 1,733Mbps. You’ll never see real-world speeds that high—as distance, protocol overhead, and other factors eat away at those theoretical maximums—but you can use them for the sake of comparison. The Velop’s two 5GHz networks, in contrast, each offer the same max theoretical speed: 866Mbps. And a Velop network will automatically steer clients to one or the other network, choosing on-the-fly which 5GHz network will be used for data backhaul (i.e., sending packets back to the node that’s configured as a router). The Orbi dedicates its higher-bandwidth 4x4 radio to backhaul, even if you operate it without a satellite. The backhaul network uses the higher 5GHz channels (149 and up), leaving the lower channels (36 and up) to the router. The Netgear Orbi is unique among new-school routers in that it has a three-port gigabit ethernet switch. The satellite has a four-port switch. Netgear says an Orbi router without a satellite will blanket a 2,000-square-foot home with Wi-Fi, and that each satellite will add another 2,000 square feet of coverage. My home is about 2,800 square feet, so the company sent me a two-pack for this review. 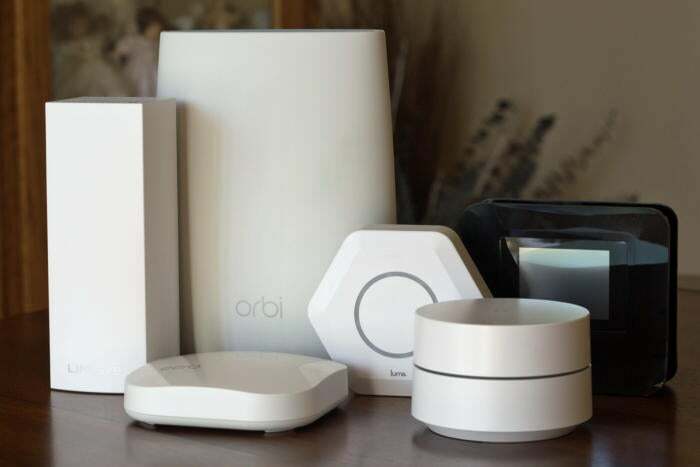 You can also purchase the Orbi in a three-pack (one router and two satellites), and Netgear will soon offer the satellite on its own for pairing with an existing Orbi router. Since the Orbi isn’t a true mesh network, each satellite connects to the router and not to another satellite. Netgear tells me it’ll eventually enable a daisy-chain mode that will provide satellite-to-satellite communication, but not until it’s possible for the network to automatically steer clients between the router and the satellite(s) as clients move about the house. Netgear offers a setup app, or you can install and configure the Orbi the old-fashioned way, via a web browser. I much prefer the latter because I can use a larger screen (my eyesight has never been great, and it gets worse the older I get). Orbi is not currently compatible with Amazon’s Alexa digital assistant, but Netgear tells me it’s just waiting for that certification to come through. 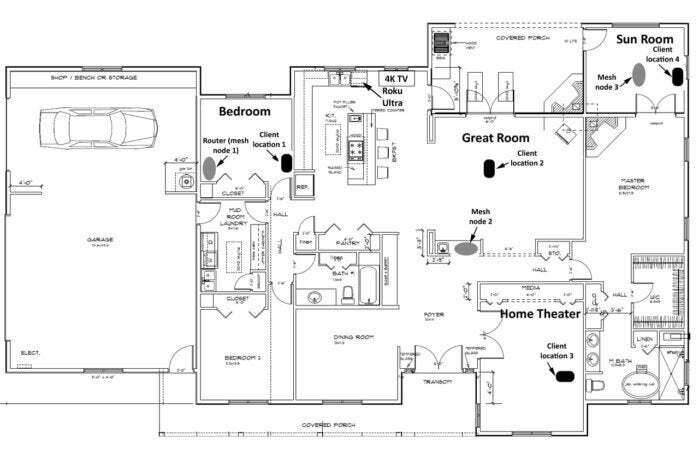 This floorplan shows where the router, mesh nodes, and clients were placed for benchmarking. The Orbi satellite was deployed in the great room. 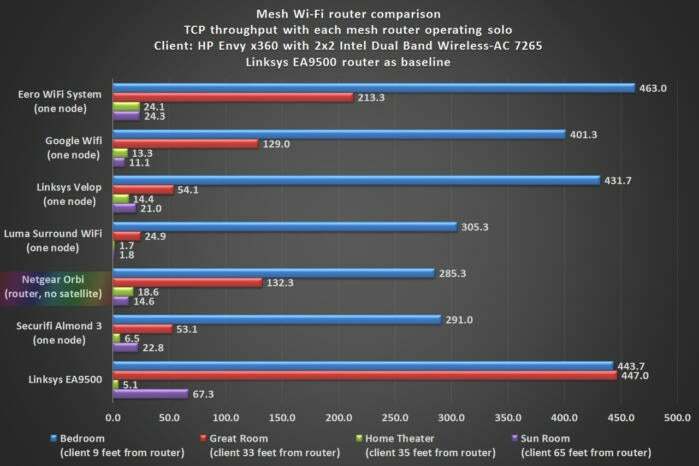 At close range—with the client in the same room as the router, separated by nine feet of air—the Orbi’s TCP throughput of 285.3Mbps trailed the five mesh routers I compared it with. The Eero WiFi System (463Mbps), Linksys Velop (431.7Mbps), and Google Wifi (401.3Mbps) were way out in front at this location. But when I moved the client to my great room, 33 feet from the router with an insulated wall, some plywood cabinets, and a number of kitchen appliances in the signal path, the Orbi jumped ahead of most of the mesh routers to deliver TCP throughput of 132.3Mbps. The Eero was faster, though, delivering throughput of 213.3Mbps. Interestingly, adding an Orbi satellite to the equation dramatically increased throughput at close range as well as at the other three locations where I placed the client PC. The Eero WiFi System was still slightly faster in the bedroom spot (459.7Mbps compared to 428.0Mbps), and the Linksys Velop was faster in the great room (276.0Mbps versus 224.0Mbps), but the Orbi was dramatically faster than all of the mesh routers in my difficult-to-penetrate home theater. It was more than twice as fast at long range, when the client was in my sun room, 65 feet from the router with three insulated interior walls and two fireplaces in the signal path. 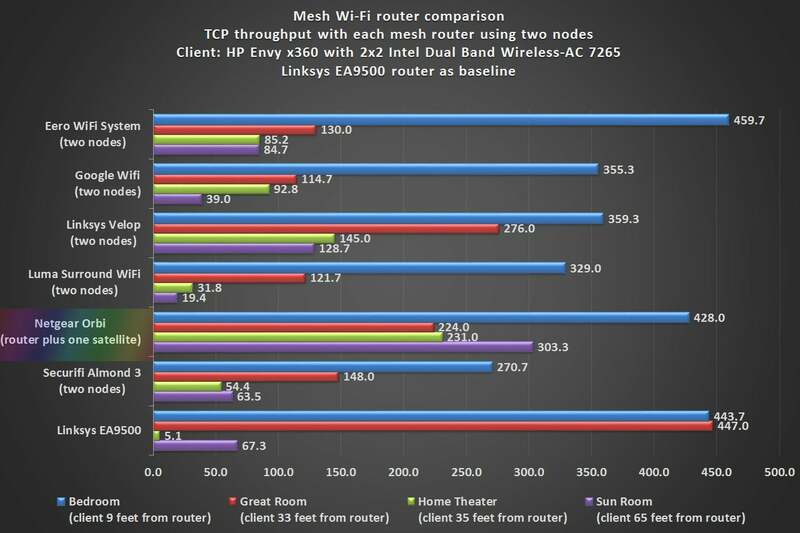 And if you examine the chart below, you’ll see that the Orbi with one satellite was considerably faster than most of the mesh network routers operating a router and two nodes. The Linksys Velop was faster in the great room, but the Orbi was significantly faster than everything else in the three other locations, including my home theater. 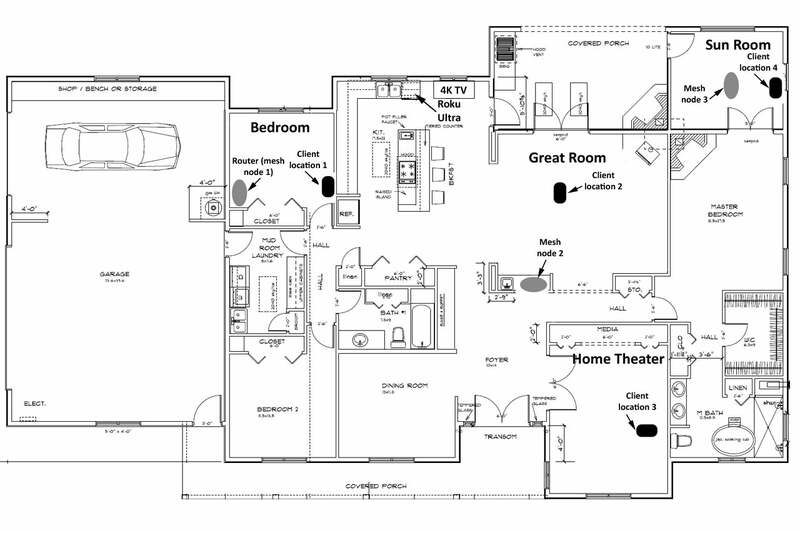 The conventional router I used for a baseline—the Linksys EA9500—was faster than anything else in the great room, but the Orbi with its satellite clobbered the EA9500 in the more difficult places to reach: the home theater and the sun room. My final performance chart shows how each router performs under pressure. 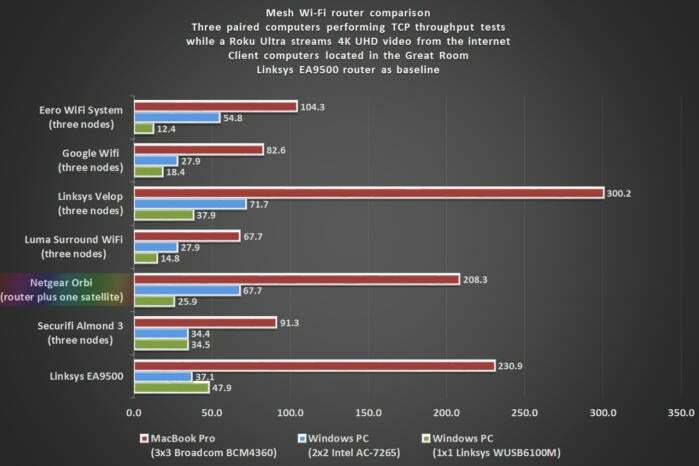 For this test, I run wireless TCP-throughput benchmarks on three pairs of computers (four Windows machines and two MacOS computers) placed 33 feet from the router while simultaneously streaming 4K video from a Roku Ultra streaming box that’s wirelessly connected to the network. The Linksys Velop won that competition, at least with the MacBook Pro, delivering much faster TCP throughput. The MacBook Pro, it should be noted, is one of the few laptops on the market to come from the factory with a 3x3 802.11ac adapter on board. The fact that the Velop was operating with three nodes, compared to the Orbi having a single satellite, should not have factored into the performance equation because the client computers can associate with only one node at a time. I presume they would have connected to the closest node, which was placed in the same spot where I put the Orbi satellite. The performance delta among the Windows clients wasn’t nearly as significant. Don’t get hung up on the fact that the Netgear Orbi operates on a hub-and-spoke topology versus mesh; the bottom line is that this is an outstanding Wi-Fi router. By including a three-port switch on the router and a four-port switch on the satellite, it strikes a better balance between unobtrusive industrial design and conventional router features than any of the mesh routers I’ve tested so far. It’s not as fast on its own with a close-range client when compared to the Eero, Google Wifi, or Linksys Velop, but adding one satellite instantly changed that scenario, putting it at the top of the performance heap at every location I tested. 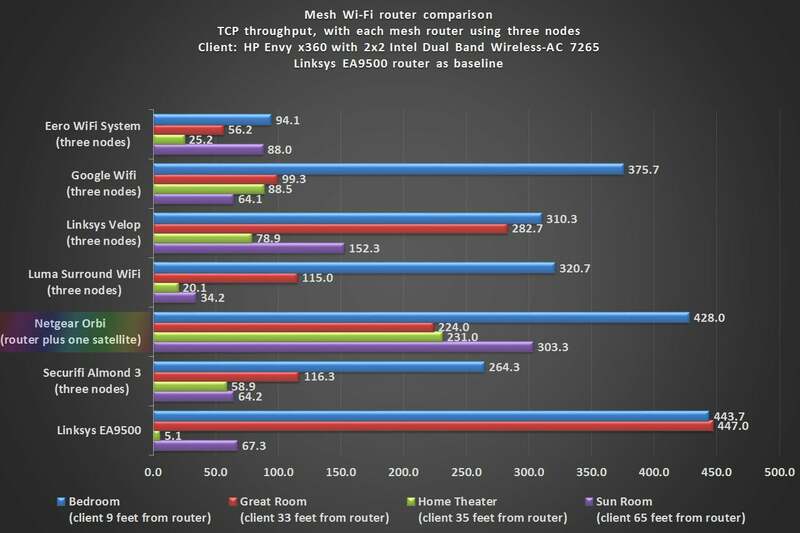 In fact, an Orbi with one satellite delivered higher performance than every mesh router operating with three nodes. If you live in a small apartment, on the other hand, the incredibly cheap Google Wifi is probably the better choice—if you can find one. It’s priced at just $129, but seems to be out of stock everywhere. A single Eero WiFi or Linksys Velop would be my next pick for smaller dwellings; those go for about $200 each. And if you don’t mind the look, you’ll find plenty of conventional routers with external antennas that deliver terrific performance.